I’ve had my System76 Galago Pro laptop for about five months now, and figured it was as good as time as any to go ahead and jot down my thoughts on the laptop. It’s hard to really know how you feel about such an important machine right from the get-go. If you’re like me, you spend most of your day staring at and interacting with your “daily driver”, and only after a few months can you know how you genuinely feel about it. I’ll go ahead and tell you that it’s my favorite laptop that I’ve had in ages. It’s a nearly perfect device for me, but at the same time I’m not sure that it would be a perfect device for everyone. And I’ll explain why. There is something about the look of the laptop that I am absolutely in love with, but I can’t quite put my finger on what it is. Perhaps it’s the angle of the hinge, or the stylish System76 logo on the lid, or the perfect balance between elegant design and industrialism, but there is something about the overall look of the laptop that I prefer even over MacBooks. I had a few problems with my previous laptop, a Dell XPS 13 Developer Edition, and they are all solved here. Annoyingly, the rubber strip on the bottom to keep the laptop from sliding on a table started losing its adhesive on my XPS 13, and for years every time you’d touch the laptop your hands would get super sticky with glue. The rubber strip on the bottom of the Galago, however, is nice and large, and hasn’t budged an inch. No glue residue to speak of. The XPS 13 also had some serious cooling issues because (almost all of) the ventilation was done through the bottom vent which inevitably got covered when sitting on your lap, or resting on a blanket, or even on certain tables. Wonderfully, though, it seems that the Galago intakes air through the bottom, which then flows out via a large and very effective vent near the hinge area. There are times when the fans turn on and it’s noticeably loud, but it doesn’t do that annoyingly often, and I love knowing how well it’s cooling the laptop when it is running. I love the fact that this laptop has actual LEDs on the front to show me when it’s powered on and when it’s accessing the SSD. I find that information extremely useful in day-to-day operation, and am sad that the trend these days is to remove these indicators in favor of an uninterrupted slab of aluminum. What can I say, the display is just absolutely gorgeous. This HiDPI display has a native resolution of 3200x1600, which means everything appears at the scale of a 1600x900 display, the definitive ideal resolution for a display this size (the XPS 13 had a 1080p display at the same screen size and was just too darn small). The colors are accurate and vivid, the viewing angles are great, and it gets super bright. All around, I can’t say enough good things about the built-in display. Text is crisp and images are gorgeous. It honestly looks better than the MacBook Pro Retina that I use for work. The only complaint, and this probably falls more in the area of performance, is that running at that resolution makes everything feel ever-so-slightly sluggish due to the fact that there’s not a dedicated graphics card handling that extra work. Both Pantheon and GNOME Shell at times feel sluggish. If I’m in a mood where performance is especially important I sometimes do single monitor mode on an external 1080p display, and it flies. That said, it’s not so under-powered that using the built-in display is a hindrance. It’s mainly just the OS components that lag a bit, and I’m willing to bet 90% of people won’t notice it in the first place. As far as laptop keyboards go, this is one of the better ones that I have used. There is a fair bit of travel and bounce, and it’s a much more enjoyable typing experience than my old XPS 13. I would say that it’s either on par or slightly better than the MacBook Pro keyboards (the classic style too, not just the new butterfly mechanisms). I absolutely love it. If I were to rank laptop keyboards through the ages I would go ThinkPad -> Galago -> MacBook -> All Others. The trackpad, unfortunately, is a different story. The surface is plastic-y and dissatisfying to move your finger across, and is on the small side when compared to the trackpads you might find on both Apple laptops and the Dell XPS 13. I also don’t find the physical buttons very enjoyable to use. I much prefer the clickpad style. I think it’s fair to say that the trackpad is the most disappointing feature of the laptop. That said, it’s not the worst trackpad I’ve ever used, and because I’m almost always connected to a mouse it’s certainly not a deal-breaker. The speakers are quiet and lack significant bass. They’ll do in a pinch, but they don’t pack anywhere near the punch of speakers in similar devices (or even my iPad Pro or iPhone). This laptop is very, very fast, particularly when you compare it with other ultrabooks or devices in a similar category. It can be configured with different processors, memory, and storage options so it’s hard to say definitively how fast it is, but mine is a quad-core with hyperthreading, so I end up with 8 virtual cores for execution. I went with 8GB of RAM, but the wonderful thing (and all-too-rare nowadays) is that I can open it up and throw in more memory any time I want, so I will probably upgrade to 16 or maybe even 32GB of RAM in the future. Bottom line: this thing outperforms my MacBook Pro, and is the fastest machine I’ve ever owned. Sure, there are gaming laptops and desktops that will blow it out of the water, but for the size, form factor, and price, it does better than it really has any right doing. Unfortunately, I feel like this would be the deal-breaker for 90% of people, and justifiably so. On average I get around two hours of battery life on this thing. It’s not defective, that’s just the reality of having a comparatively small battery coupled with operating systems that just aren’t fine-tuned enough to eek out every extra bit of juice that it can. If I only use it for web browsing and take my time I can get close to three hours, but similarly I’ve seen a couple times where watching 1080p YouTube videos can cause it to last less than an hour and a half. I feel like in 2018 that’s kind of a deal-breaker. That said, I use it all day long for work, and both at work and home it’s plugged into an AC adapter (I purchased an extra one for this reason), so battery life just doesn’t matter much to me any more. If I were still in college this probably wouldn’t work great for me, but I don’t really go to coffee shops or the library or anything, so battery life only slightly matters to me. Ordering the laptop is one of the most pleasant and straight-forward processes that I’ve seen from from PC manufacturers. It’s easy to see and customize all your options, and checking out is dead simple as well. Browsing the catalog is great as well, so purely from the store aspect, ordering from System76 is lovely. That said, the time between placing an order and having a computer show up at your door is way too long in my opinion. When you place the order they make a note that says something along the lines of “we build every single machine to order,” like it’s a point of pride, but the fact is that it takes around 3–5 days for them to build your machine before they even ship it. This sounds great, but let’s be honest for a minute: it’s not like I’m at Subway ordering a sandwich here, making it to order doesn’t provide me any direct benefit. And I completely understand that they need to do it this way in order to support all the various customization options, but I would imagine that for certain popular combinations (for example, the base model like I got) they might go ahead and make up a few ahead of time so they can ship them out relatively quickly. At the end of the day, I found myself without a computer for two weeks after ordering, and in this day and age that’s a genuine problem. I’m hoping that their new Denver-based manufacturing efforts can help speed up this process. I absolutely love the built-in ethernet jack. There are times when I need to plug into a network with a physical connection, and I love not having to use a dongle. Plus, the little flappy door is brilliant. I can see this being one of the pieces that wears out over time, but at least for now, I couldn’t be happier with it. Also, holy cow is the unboxing experience wonderful. 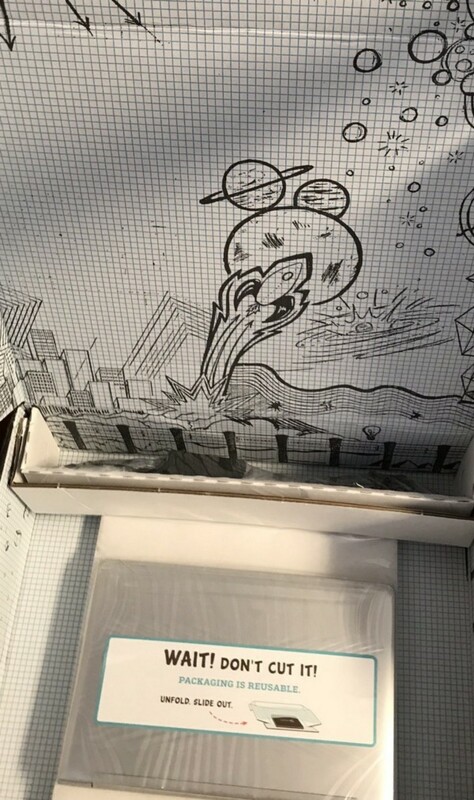 The box that arrives is really neat, and the artwork that Kate Hazen designed looks great and has an incredible amount of charm and personality. It makes the unboxing experience exciting and memorable, so hats of to them on it. I absolutely love my laptop. I love the way it looks. I love how it performs. I love that incredible HiDPI display. I wish it had better battery life, I wish the trackpad was much more enjoyable to use, and I wish the speakers had a little more “umphf” to them. That said, this thing is rugged, reliable, and a pleasure to interact with each day. It’s my favorite laptop in years.